Private and secure restored Mediterranean 3 +4 villa on prime lower Doheny dr. Ideal for those who value its location and who wish to live in lush greenery. Formal entry to Spanish tower with high sleek walls and plenty of light. Large living room with fireplace and wood floors overlooks lush garden with specimen trees and complete privacy. Plenty of wall space for art work! Separate den is warm and cozy and a comfortable office or tv room. Large formal dining room with views of the pool and yard has plenty of room for large furniture. Kitchen with granite counters and stainless steel appliances overlook the pool and gardens beyond. Downstairs bedroom and bath currently used as music studio. Upstairs huge master bedroom with separate walk in closet and lavish master bathroom overlooks pool and gardens. Guest room is separate and has private bath and two closets. Outside pool and covered patio plus enclosed cabana are great for entertaining. Separate wine cellar. California Bungalow elevated above the street in Highland Park, with lovely views. 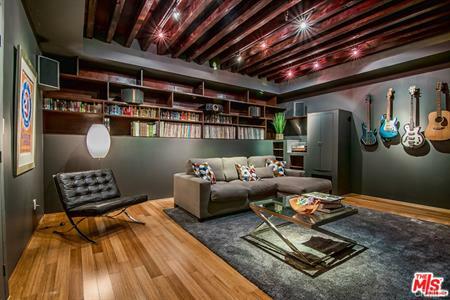 Built in 1926 and has been renovated with style, mindful of the original details. Front porch with scenic views, living and dining spaces featuring vintage windows, archways and hardwood floors. Kitchen has a center island, subway tile backsplash, vintage stove and greenhouse window. Two bedrooms include the master with French doors opening to the patio; the bathroom is finished with penny tile and a soaking tub. 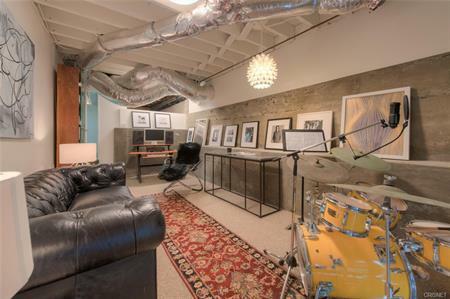 Soundproofing in the garage that is converted to a music studio, plus there's a bonus laundry shed. Hardscape patio with pergola with built-in seating and large flat back yard with treetop views of Mount Washington. Right down the street, York Boulevard local favorites; Hinterhof, Kumquat Coffee, Joy, Town Pizza and more. Prime Echo Park contemporary Mediterranean with jarrah wood floors, architectural iron railings, whole-home audio and retro lighting fixtures. The main floor includes open kitchen with vintage Wedgewood stove, dining area, den with brick-surround fireplace, updated bathroom with steam shower, and a laundry room/storage. Upstairs is a spacious master with vaulted ceilings, private balcony, and walk-in closet, a full bathroom with separate tub and steam shower, and the guest bedroom with balcony and hillside views. 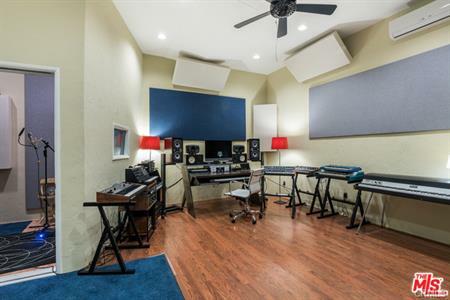 Plus a bonus space that has been converted to a professional music studio with live and control rooms, making this the perfect live/work space. Back patio with BBQ. Stunning 3-Story modern hillside Eagle Rock home! Spacious 3 bedrooms, 3 ½ baths, 3 terraces, views and bonus room! Upper level is a loft-style family room, bedroom/office, full bath, and private terrace. 2nd level boasts open-concept kitchen/living and dining with high-ceilings. Chef's kitchen features quartz counters, white shaker cabinets, island and stainless steel appliances. 1/2 bath, walk-in closet, wet-bar and laundry room also on this level. 3rd level features two master bedroom suites. 1st spacious master has sitting room, en suite master bath with rainshower, modern tile and river rock. French doors open to terrace. 2nd master has en suite bath with river-rock shower, separate vanity and walk-in closet. 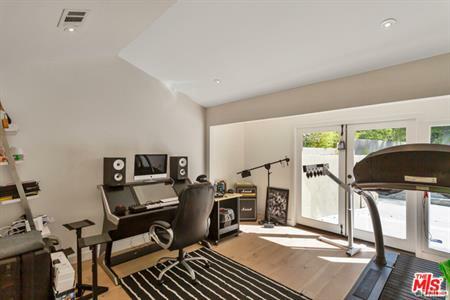 Oversized bonus room is used a music studio with separate entrance and private deck! Remodeled in 2015. Home also features overhead recessed LED lighting, newer HVAC, and two covered parking spaces. Modern, chic Mount Washington view home, perched on a hillside. 1,940 sqft of living space with 3 bed/3 bth + bonus media room. Private courtyard, main level with open floor plan and expansive views. Living room with fireplace flows to kitchen with Italian cabinets, center island, stainless steel appliances, pantry and dining area. Two patios and a powder room round out the main floor. Lower level with private master suite and patio, master bath with soaking tub, separate shower, and walk in closet. Two additional bedrooms and hallway bathroom. Large bonus room / media room with in-wall wiring for 7.1 sound (currently setup as sound recording studio). Direct access from two car garage. Home has all the amenities of a modern lifestyle. Top ranking Mt. Washington Elementary School District. Stunning tri-level home nestled in the Hollywood Hills. This 5 bedroom, 3 bath home features incredible views with numerous balconies and sitting areas. The luxurious master bedroom features vaulted ceilings, large walk-in closet and a balcony with large sliding glass doors. The master bath is stunning with its granite counters, charming mosaic tile, glass shower and separate bathing room. The other four bedrooms are spacious. The home is fully equipped with an open game room, recording studio, built-in wet bar, tons of outdoor living space, built-in solar panels and a new sparkling pool! 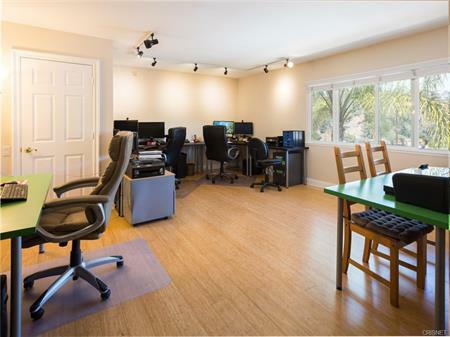 This home offers the perfect location conveniently located close to freeways. Unique contemporary tri-level architectural in the Hollywood Dell. Main level is an open design living space with recently renovated kitchen, dining/office area, master suite, guest bedroom and a powder room. Warm, rich bamboo flooring throughout, new main bathroom with enclosed shower and bathtub. The living area opens to outdoor entertaining with three 9-foot beautifully trimmed sliders. Stunning views of the Santa Monica Mountains and breathtaking sunsets. Top level is a detached guest bedroom with ensuite bath, rooftop deck with panoramic views, and a super-clean garage. 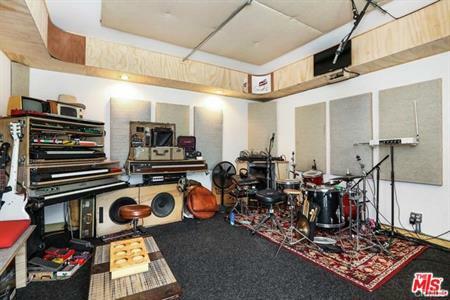 The lower level is a large studio with en-suite bath that is currently a music studio, office space, as well as a wide grassy terrace. The Thomas House, 1947. One of only two residential homes by noted modernist designer Alvin Lustig. Lustig's mid-century modern gem in the heart of Silver Lake has been well-preserved/restored and offers a rare opportunity in one of LA's most coveted neighborhoods. Set up from the street with lovely views, the timeless modern design is on display with its "glass box" design brings the outdoors inside through walls of glass and intersecting Redwood trellises. An open floor plan provides seamless flow between rooms as well as outdoor spaces. 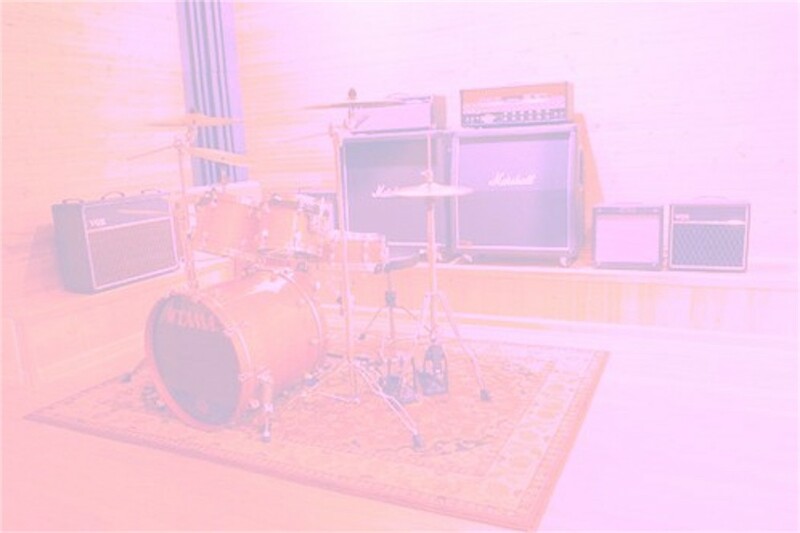 3 bedrooms and 2 bathrooms including a detached 300sf bonus space/music studio below the house with separate entrance. Prime location close to the Silver Lake Reservoir as well as many of the area's best restaurants, shops & nightlife. Ivanhoe School District. ATTN: all Investors looking for a property that generates continuous cash flow! This Hollywood hillside home with stunning canyon views has two beautiful outdoor decks. Spacious living room with picturesque views including a cozy fireplace, wood-beamed ceilings and open glass doors leading out to the canyon deck. Kitchen with stainless appliances and a breakfast bar and a half bathroom. Descend the stairs to find two bedrooms filled with natural light. The Master bedroom features plenty of closet space and a master bath with dual designer sinks. The lower level features an additional bathroom with a soaking tub surrounded by travertine floors and walls. 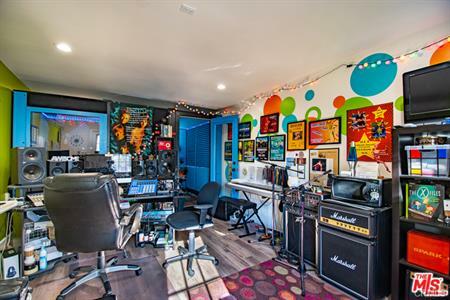 Standing out from other properties, this home features a bonus room that has been designed as a recording studio! Each level contains its own private outdoor entry. Close to the best shops and restaurants Sunset Strip has to offer! 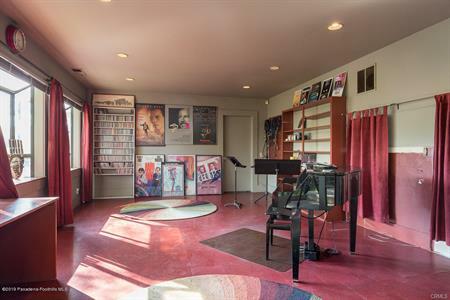 Built high in the hills of Beachwood Canyon in 1915, this property was purchased in 1985 by noted composer, Arthur B. Rubinstein, who wrote numerous film scores in the attached music studio. The grand entry leads to an expansive living room with stunning views, and of course, room for a grand piano and a separate sitting with a fireplace. Rounded hardwood steps lead to an elevated landing and give the room an elegant, Art Deco feel. The formal dining room overlooks the living areas and has a wall of windows and French doors leading to one of many outdoor patios and pool area. Spacious kitchen, butler's pantry and open bar area. The upstairs features a large master bedroom suite, two additional bedrooms, three bathrooms and a sun room. Covered parking for four cars plus three additional spaces. 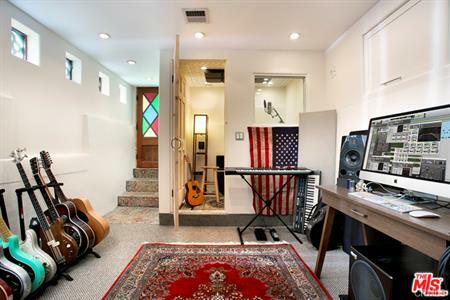 Amazing Live/Work opportunity in Glassell Park! This sleek modern property features a spacious open layout, high ceilings, central A/C and heat, 5KW solar system, patio-garden next to bedrooms. 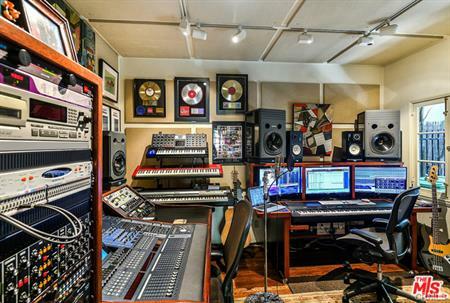 Previously used as a recording studio and is very quiet inside. 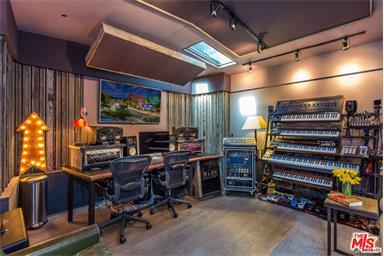 The 2 car garage is used as a work room/studio, adding apx. 400 sqft to the public records. Electric gated parking for 3-4 cars, plus street parking. 2,000+ sq ft gated flat lot behind property can fit many cars or building opportunity. Close to freeways, public transportation, shopping, and restaurants. Fletcher Drive is now an upgraded street with bike lanes and trees. Great visibility with complete privacy inside. A rare Hollywood Hills property at the end of a cul de sac street, secluded and tucked away, surrounded by views of the hills. The house features 3 bedrooms + 2 baths, an open space living with hardwood floors throughout and new kitchen with Sub Zero/Wolf appliances. Completely renovated and a new construction of 250 SqFt permitted, sound proof studio which consists of a 1 bedroom + 1 bath. A large front and back yards with heated salt water pool and spa. New retaining walls and 8+Ft ficus trees surrounding the property. New remote drive way gate and security system with surveillance cameras. Sophisticated turnkey residence has an ideal layout and is fully remodeled with thoughtful, stylish design. Gated front yard, living room with beautiful hardwood floors. Spacious kitchen with double wall oven, high-end appliances, and custom cabinetry overlooks the warm, inviting family room with fireplace and oversized sliding glass doors for indoor-outdoor living. Two generous bedrooms, both with ensuite baths, and an additional powder room complete this well-designed home. Stunning backyard with entertaining areas including a patio with cafe lights, grassy yard, pool and spa. 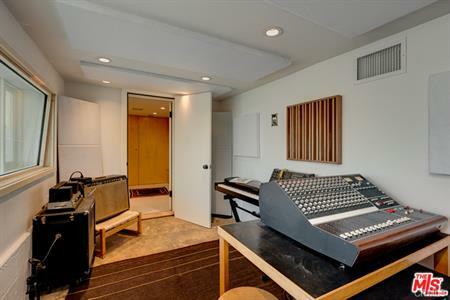 Detached guest house with bath was built by famed architect George Augspurger as a music recording studio but the possibilities are endless.